If gaining popularity on YouTube is a mystery to you, then you’re in the right place! When we look at the most-viewed channels and videos on YouTube, it can be easy to put their fortune down to the fact that the channel is already well-known and has lots of subscribers. But every single YouTube user started with 0 views and 0 subscribers. Every single one. So how can one video about [enter any subject here!] accumulate millions of views, while another video about the same subject can barely reach ten people? The answer is not elusive or mysterious. The answer is YouTube SEO. If you want people to see your videos, then you need to optimise your videos. This is especially important now with new creators joining the platform frequently. In our 2019 State of Video Marketing Survey, we found that 88% of marketers plan to use YouTube as a channel, and according to a Business Insider study, a staggering 567,000 hours of video are uploaded to YouTube every day. Whether you’ve already posted your videos to YouTube, or you haven’t even pressed record yet, creating a focus keyword for each video will really help your rankings. All search engines work by matching the users search term with the most relevant results–and YouTube is no different! If you’re jazzing up old YouTube videos, re-watch them and try to pinpoint the main topic. Ask yourself: What is the focus of this video? What is the key word? For any future videos, it’s easier if you choose a keyword before you start. 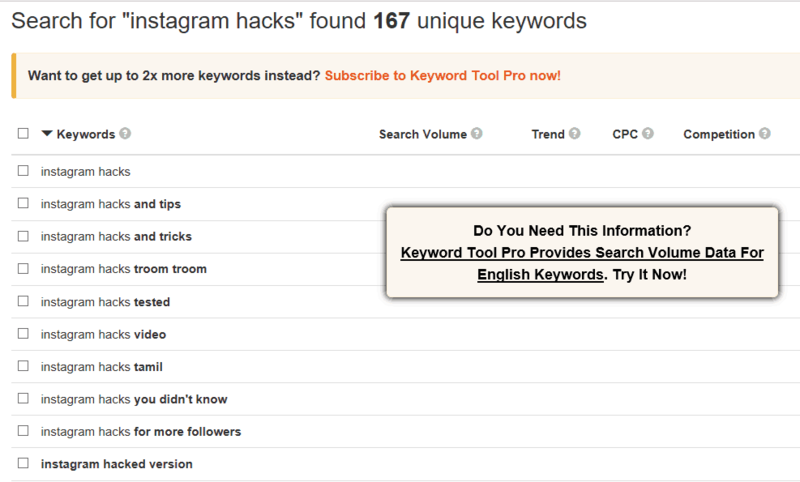 That way, you can use a keyword research tool to help you find the most popular search terms to use. But with the pro version, you can dig a little deeper by also comparing search volume, CPC (cost-per-click), and competition. This will help you to find a set of keywords that have a high search volume and low competition to give you the best chance of ranking higher on YouTube. Once you’ve found a keyword that closely matches the topic of your video and seems to offer a good opportunity, jot it down and carry on reading this article for tips on how to use it to rank higher. Once you’ve got your keyword, you can begin to use it to optimise your video in different ways to help you improve your YouTube ranking. One of the simplest ways to do this is to include the keyword in your title. But, with 400 hours of video uploaded to YouTube every minute(! ), a keyword alone is not going to be enough to give you a huge SEO boost. You need to think deeper. 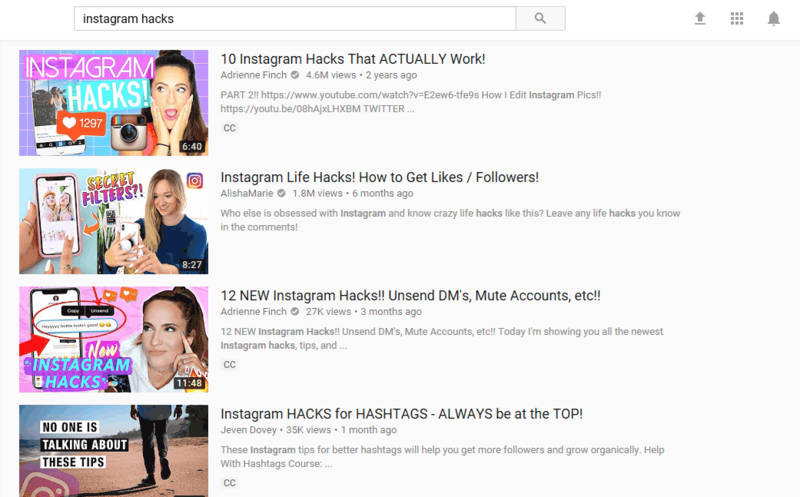 Let your viewers know exactly how many hacks you are going to teach them, or promise them something specific and highly sought-after like the second video in the above example. In addition to optimising your title, you also need to optimise your description. Now, while your title is mainly to catch the eye of potential viewers, you can be a little more in-depth with your description. YouTube displays the first 125 characters of your description, but it is a good idea to write around double that–aiming for 250 words if you can. YouTube also recommends that you put the most important keywords toward the beginning of your description. Of course, it’s not all about the algorithm. Your viewers will be reading this too, so make sure you keep their engagement in mind. Don’t forget to include your keyword(s)! Straight away we can see a link to the creator’s website. 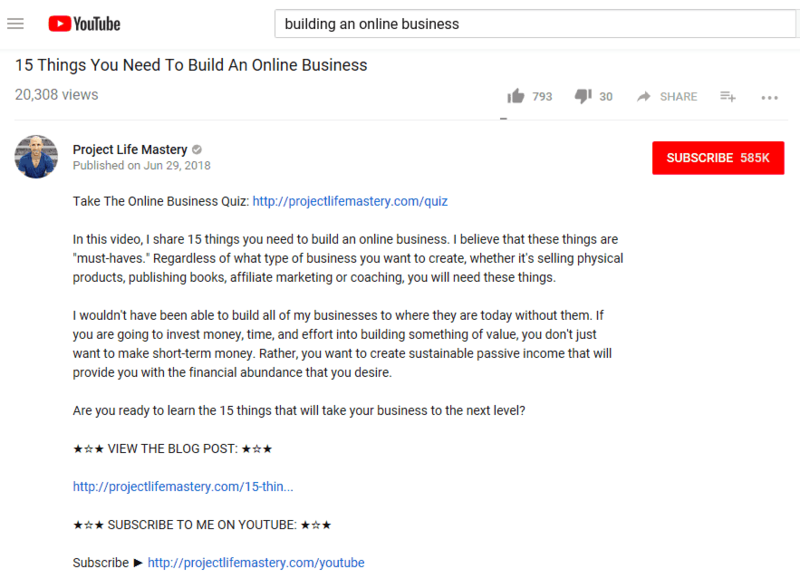 Then below that are a couple of lengthy paragraphs about the video, including the title of the video and the keyword (build an online business) in the very first sentence. A unique, optimised description like this allows YouTube to understand what your video is about and then put it in front of the right people. Notice that they don’t need to be super-specific. There is a Chrome Extension for YouTube called Tube Buddy. Among many other features is keyword rank tracking, and this allows you to find out the search ranking for different tags so you can use the best ones for SEO. You should also use an app like VidIQ to help you see what tags your competitors are using. By using the same tags as your competitors, your videos will start ranking in the ‘Up Next’ section whenever someone watches their videos–so you can direct attention from them to you! You might be tempted to skip this point. After all, scripts are wooden and awkward, and you want to come across as natural and spontaneous, right? Well, an engaging, well-written script can actually give you a better chance of coming across as natural and spontaneous, while at the same time ensuring you don’t get sidetracked and lose viewers. A script can help you tighten up your language, cut out the “ums”, “ahs”, and “where was I?” and grab your viewers’ attention. A study by AdAge in 2015 (a lifetime ago in video marketing years) found that marketers have just 10 seconds to capture and engage their audience before losing them. Their study also found that if your audience isn’t fully engaged by the first 30 seconds, then you’ve likely lost 33% of them. And remember, that was in 2015! It’s even more difficult now. So make sure you write a script with a short and snappy intro, one that gets to the point quickly and informs viewers why they should stay tuned. Think of it as an expansion on your title–set a promise at the start that you will fulfil by the end. In fact, YouTube actually use total view duration as a ranking factor. It makes sense if you think about it–the longer you watch, the more engaged you are, the more likely you are to watch more videos and the more likely you are to see the advertisements – aka kerching for YouTube!! The longer your videos are watched, the higher your rankings are likely to be. This naturally means YouTube favours longer videos that can be watched for longer periods. However, this doesn’t mean that you should try and drag your videos out for as long as possible, it just means that you shouldn’t feel pressured to fit everything into a limited time slot. If your videos are long and comprehensive, yet still engaging enough to keep viewers watching, YouTube will definitely take note and you’ll start to rank higher. It’s all well and good to create a long video with keywords in all the right places, but if you can’t get people to stick around and watch your video then you’re going to be sending a very bad message to YouTube. Watch-time is extremely important for YouTube SEO, so viewer retention is key. If you want to keep people watching your videos, you need to make sure they are as visually entertaining as possible. So many creators just sit in front of a camera and talk, but that isn’t very engaging. This video is almost 10 minutes long and the subject matter could be considered dry by some. However, the added animation and fun editing makes the video so much more engaging. To make sure your videos stand out, try adding some animation here and there, or put a lot of effort into your editing to keep viewers on their toes. With this in mind, it’s also important to get to the point quickly at the start of your video. Tell the viewer what the video is about, how you’re going to help them and then get started. It’s also a good idea to compare the watch-times of your previous videos. This will help you to see if there is a particular topic or video-style that your audience enjoys more. This is from a study of 1.3 million YouTube videos by Brian Dean, founder of Backlinko, and it shows a clear correlation between video comments and YouTube ranking. There are only two things a viewer sees before deciding to click on your video: The video title and the thumbnail. And, with visual information processed 60,000 faster than text, that thumbnail really counts! Each thumbnail has been selected to draw viewers in. The presenters are looking directly at the camera and the text on screen further reiterates what the video is going to be about. This encourages users to click on the video, and a high click-through rate will seriously strengthen your ranking performance. Playlists are an amazing way to increase the overall watch time of your channel because they play automatically. So instead of watching just one of your videos, a viewer might watch five or six! It also helps to get in touch with people who create similar content to you (but aren’t your competitors!) and ask them to add your videos to one of their playlists. The more playlists your videos are featured in, the better! I LOVE your channel! Your recent video about [TOPIC] was really interesting to me because [ADD COMPLIMENTS & SHOW INTEREST]. I’d be happy to return the favour. Just let me know which of your videos you would like me to pop into my playlists. When you contact these people, make sure you let them know why it is good for them too. You don’t want them to think you are simply asking for a favour. By including your videos in their playlists, they can cater to their viewers’ needs and also increase their own watch-time. It also helps to offer to include their videos in your playlists too–sort of like a swap! Link building is a huge ranking factor for any piece of content, video included. If you are familiar with optimising written content, like your blog or website, for Google, then you’ll know that they count the number of backlinks to help them determine how valuable your content is. Seeing as Google owns YouTube, it should be no surprise that YouTube works in this way too. To increase your backlinks, be sure to post your video in as many places as you can, like your website and your blog. You could also ask other websites in your niche to post your video on their site or write guest posts for them that include your video. The more backlinks you have, the better your YouTube SEO will be, and also your Google SEO. One last way to rank higher on YouTube is by spreading the word about your video in as many different places as you can think of! Basically, the more social signals your video has, the better. So share it on all of your social platforms, and encourage people that you know to share it, too. Reddit has around 1.6 billion unique monthly users, and thanks to sub-reddits they are all divided into niches, making it easier for you to reach the right people and increase the CTR on your videos! YouTube videos are able to support closed captions to benefit people with hearing difficulties. An added bonus of these captions is that they are crawled by YouTube and Google, so they can work to boost your SEO! YouTube is a competitive place to share your content because there are SO many people visiting it on a daily basis. And while the competitiveness can be off-putting at times, you just need to remember that there are still many ways you can rank higher and improve your YouTube SEO to make your channel and your videos more lucrative for your business. If you’re struggling to come up with top video content ideas in the first place, our blog post: 21 YouTube Video Ideas for Businesses, would be the perfect place to start. What Counts as a View on YouTube, Facebook, and Instagram?